Crudes prices are down to $46.58 this morning after significant losses yesterday and continued losses this morning. After some early morning strength yesterday, prices gave up 94 cents (-2.0%) following the EIA’s inventory report. Crude prices have fallen $.20 (-.43%) since closing yesterday as the markets continue to process the news. Refined products also took a strong beating yesterday and this morning. Diesel prices lost a full 3.06 (-1.9%) cents yesterday, along with a 1.93 cent (-1.23%) loss this morning, totaling a five-cent loss over two days. Gasoline performed slightly better than crude or diesel, but still gave up 2 cents (-1.3%) yesterday and another 2 cents this morning. Building in refined product inventories dragged the market significantly lower yesterday. On Tuesday, we wrote that fundamentals are becoming worse and worse predictors of price; yesterday’s losses are a good example of this occurring. Crude prices were drawn down by 8.9 MMbbls, the largest draw of the year. Refinery runs were the leading cause of the drop, turning crude into refined products for consumption, explaining the light gains in gasoline and diesel inventories. Markets instead focused on U.S. production, which rose to its highest point since July 2015, and is just 108 kbpd below its peak. Given the EIA’s prediction earlier this week that U.S. production will grow by 117 kbpd in September, it looks like we’re on set new record production levels. 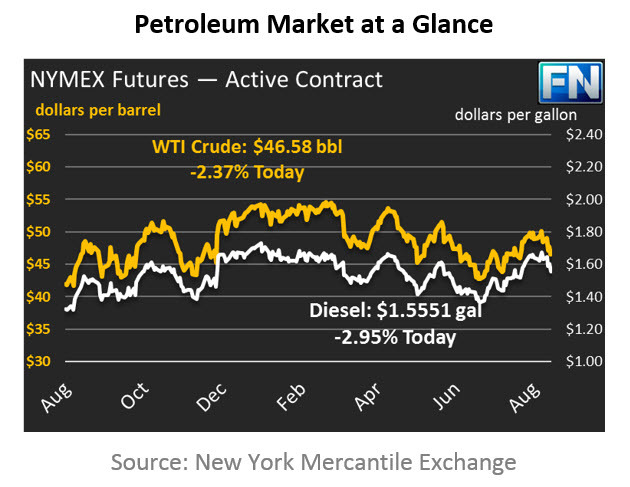 The fact that markets could not muster a rally in response to the large crude draw is surprising. Market participants point to producer hedging (ie, selling to the market) as a leading cause for the market remaining low, as well as net speculative length that is already high. If all the bullish traders have already bought the market, there are few left to help push prices higher. Markets are also being weighed down by the impending release of 14 MMbbls from the Strategic Petroleum Reserve. Additionally, while OPEC committed to cutting exports to the U.S. in August, imports from Saudi Arabia, Kuwait, and Iraq rose by 500 kbpd, a significant increase.